Which Carpet is Best for Pets? When you have a pet, it’s more than just an animal—it’s part of the family. And you want every member of your family to be comfortable in your home! 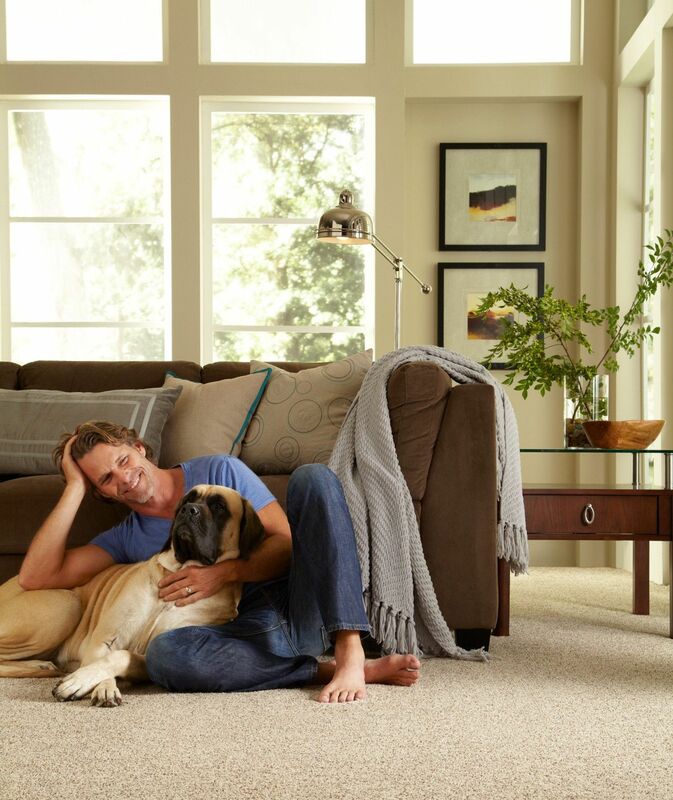 Everyone knows carpet feels great underfoot—whether you have two feet or four!—Shaw has developed some carpet benefits you’ll love, and so will your furrier family members. They add up to a healthy, sweet-smelling home for you and your pet. Stain Resistance: Pick a carpet offering R2X Stain and Soil Resistance treatment. It’s Shaw’s patented and proven system that shields your carpet well below the surface—because the entire fiber is protected, from base to tip, against stains. There is simply no better stain and soil protection in the flooring industry. With R2X, you have complete protection from the top of the yarn to the bottom. This total fiber coverage offers unprecedented protection against household spills and everyday soiling. R2X repels stains, giving you more time to respond to an accident, making it easier to clean, and keeping the stain from returning. Proper Clean-up: When spills and splatters inevitably occur, reach for the other part of Shaw’s R2X system—R2X Stain and Soil Remover. Put to the test both in clinical trials and in homes, this patented technology allows you to treat the stain without the hassle of rinsing. To top it all off, it doesn’t leave any chemical residue, and it smells GREAT! The manufacturing of carpet (carpet styles / types of carpet) - which can be described as sewing strands of yarn into a backing material - creates thousands of yarn loops. When choosing any carpet always consider color and the ability to "hide" the little things. A carpet with a little fleck of color is always a good choice as it will hide most dirt or debris tracked in by little paws until you are ready to clean. Dogs usually have a tendency to lay in the same place and you may notice rapid soiling in those areas. This is a result of oils on the dogs coat acting as a magnet for dirt and debris so always keep that in mind and have a cleaning plan for those areas. You might also want to consider that loop carpets can potentially be a problem with some pets. Your pet's nails can potentially snag a loop, pull it, and cause damage. That's not always the case, but there is a possibility, especially with larger, stronger pets. In the event you choose a loop carpet and a loop is pulled up or snagged by a pet do not cut it! Call the Institute of Inspection Cleaning and Restoration Certification (IICRC) at 844-464-4272 for details on finding a professional in your area who can help with repairs.